I've tried a number of hummus recipes over the years, and while I've enjoyed just about all of them, nothing beats the ultra simple version that I started with several years ago. All it calls for are chickpeas, tahini, lemon juice, and a pinch of sea salt - profoundly simple and profoundly good. 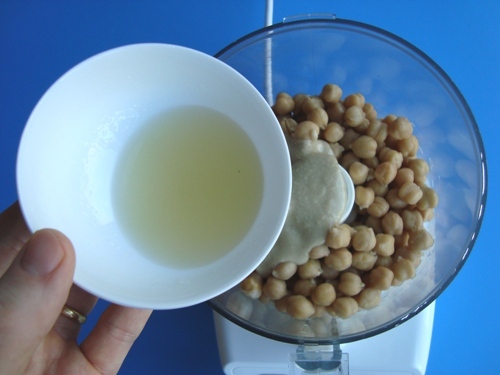 Here's how to make my favorite hummus: Start by preparing chickpeas. 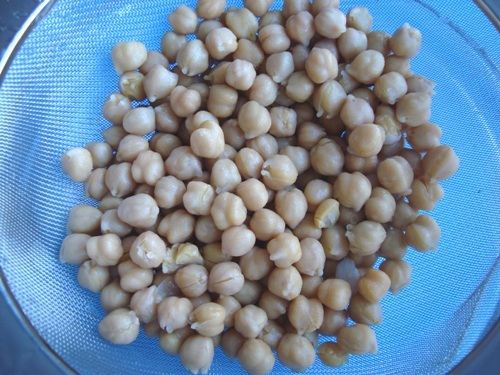 If you plan ahead, you can soak dried chickpeas overnight and boil them for an hour before you begin making hummus. You'll need about 2 cups of cooked chickpeas. Alternatively, you can use a can of pre-cooked chickpeas. Our local grocery store carries canned organic chickpeas, so this is what we typically use these days. If you use canned chickpeas, give the chickpeas a thorough rinse and let them sit in a strainer for a few minutes to allow excess water to drain away. 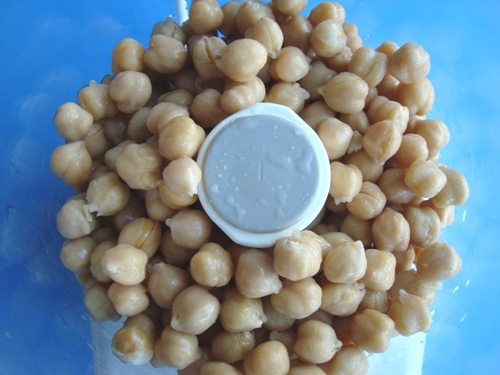 Transfer chickpeas to a food processor or a really strong blender. 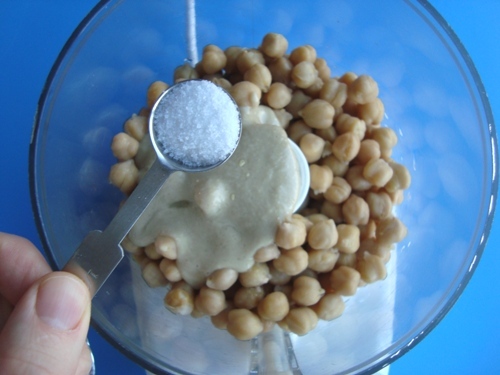 Add a good dollop - anywhere between one to three tablespoons - of tahini. Just in case you're not familiar with tahini, it's nothing but a rich paste made out of sesame seeds. 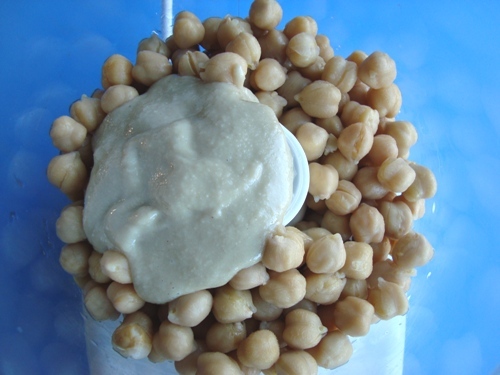 Tahini is naturally abundant in calcium and adds rich flavor and texture to any hummus recipe, so do try to include it. Any variety will do. Next, add the juice of one small to medium lemon. If all you have is a large lemon, the juice from about three-quarters will do. Add half a teaspoon of sea salt. Our boys love eating this hummus, spread on whole grain crackers, along with whatever fruit is in season - this combination makes for a lovely breakfast. These days, they've been getting a little giddy over pomegranates, which happen to go quite nicely with hummus and crackers. The natural tartness of the pomegranates strikes a nice balance with the natural but subtle sweetness of the hummus. 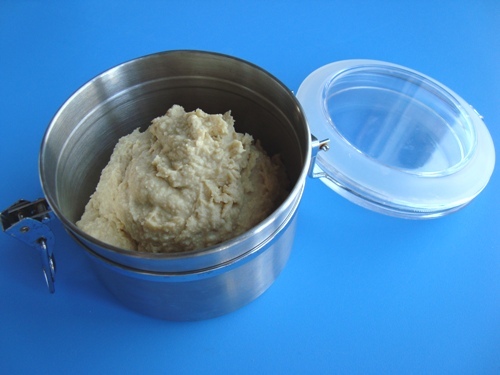 You can keep leftovers in a container that has a tight-fitting lid. As a dip for raw vegetables. As a spread on toast or sandwiches, usually combined with avocado slices, crisp lettuce, and thinly sliced cucumbers. Sliced tomatoes are good, too. 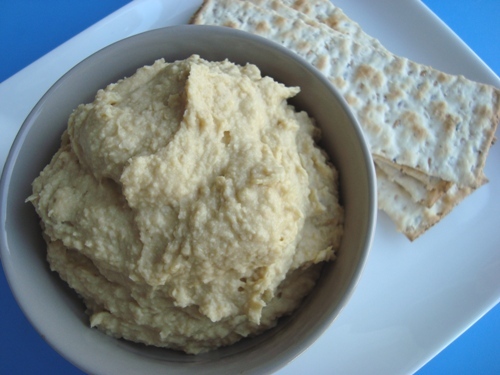 When warmed in a small saucepan, hummus makes an excellent companion to a bowl of steamed rice, white or brown. This is something I've carried over from the year that I started my fasting clinic - I wasn't married then, and a bowl of steamed rice with warm hummus was a quick and highly satisfying meal to keep me going. Please consider sharing this post with family and friends who aren't yet in touch with the magic of hummus. It's a diverse, super healthy food choice on any budget. pat pat pat :-) bravo! thanks for this and especially the extra ways to enjoy this! I agree that hummus ought to present in the frig at all times! One of my favorite uses: Thin it down a bit with water/oil and pour over a salad instead of or in addition to a dressing. It turns a salad into a meal. Yum! Hello, for the chickpea pasta sauce recipe I posted earlier, I forgot to include a couple of dashes of hot sauce. YUM!! Hummus is a great substitute for mayo on sandwiches! This recipe can be modified by adding some cold distilled water (as opposed to the liquid from the can) to thin it out, or some lime juice - along with the lemon juice - to add some kick. I sometimes add some cilantro, a little jalapeno pepper and fresh garlic, and some roasted red pepper as well. I do believe ingredients matter, so I use really good EV-OO and tahini. This dish is very inexpensive, has a long shelf life in the frig, tastes great and is very healthy. In the Middle East, it is commom to stir tahini with carob molasses, and then dip bread or sliced apples or whatever you prefer. Much better for you than carmel apples. Enjoy! As a 25 yr. long soyless vegan, I eat both for taste and nutrition. Over these long years I have learned the hard way that beans must be properly prepared or else. Soaking garbs for 24 hrs is essential. Boiling for an hour is also essential. Also essential is to cook them for many hours for digestibility. I suggest adding a large clove of garlic to this recipe. A shake of smoked Spanish paprika on top of a serving is nice. Soak dry garbanzos overnight in enough water to allow for expansion (2 C of dry = 6 C of cooked) and cook for 21 minutes in a pressure cooker. Calling for sea salt is insufficient health advice and veritably meaningless, as most of the earths sea salt beds have been bought up by Morton and Leslie and the bulk bin in your health food store that is labled "sea salt" is refined just like that in the containers. What you want is a full-mineral salt, which contains about 2% trace minerals, which are critical for health. This may sometimes be called macrobiotic quality salt. Costs more and because of the minerals it won't pour out of a shaker. If not available locally, this is a good source: http://www.goldminenaturalfood.com/ For times when a shaker is required, like salting popcorn, use an unrefined, full-mineral salt like Rockland's which is from UT mines...a sea long ago. Did you intentionally leave out the most essential ingredient that gives hummus that authentic taste - fresh garlic!!!!!!!!!!! I live in Israel where making and eating hummus is one of the national pastimes and can't imagine hummus without that special spicy kick that garlic gives it. Ben Kim's hummous recipie is not the way they make it in Israel. And, there are a few things about chick peas you need to know. First the chick peas. If you use dried ones, you do need to soak and boil them as he says. But you must also rinse them well to get all the scum off the water. And be sure to look for small rocks mixed in with the chick peas. They will do a great job on the blades of your mixer. If you use a food processor, the hummous will be grainy due to the skins on the peas. If you use a powerful blender, that may be able to smooth out the product. In the Middle East, they put the peas through a sieve to remove the skins so they get a smooth product. 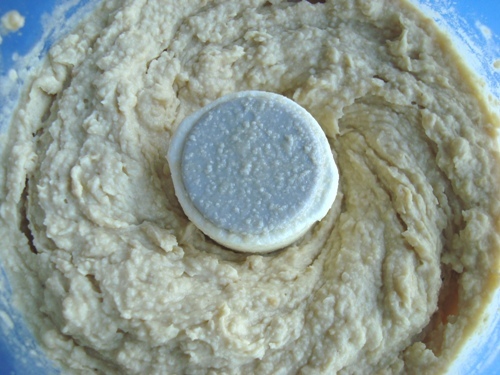 The classic hummous uses citric acid, or sour salt (called salt lemon in the ME), not lemon juice. Also, more tahini is used then he recommends, maybe 1/4 cup, and no olive oil is added. Use water to get the consistency you want. It will get thicker in the refrigerator. Also, he left out the garlic. One or two cloves is always used. Serve with a drizzle of olive oil on top and some paprika for color. These are optional. Thank for the fine hoummous recipe and the great photos. For me, the photos are an effective learning aid! I love your postings and always read them with much interest. I first sprout the humus. 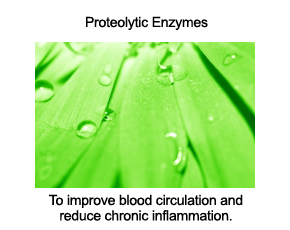 It is healthier this way and easier on the digestion.. I also sprout all dried beans, peas etc. before cooking for the same reason. 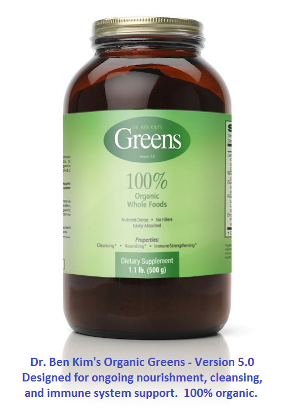 I am new to Dr Ben Kim's web site, and find myself refering everyday to all these articles and recipes. I would like to learn how to sprout dried beans and peas. One thing I like about hummous is how versatile it is! I'd like to reiterate what was written in a previous comment about using dried chick peas - it is essential to rinse them at least once during the pre-soak period: Rinse, then soak for 1 hour in water containing a teaspoon of baking soda. Then rinse & soak (in fresh water & baking soda) overnight. Rinse again, then boil for 1-2 hours (with or without baking soda). During the boil, periodically remove the foam that collects on the surface of the water. The difference between rinsed and non-rinsed beans is whether you remove grey, dirty, muddy crap or clean white foam. With the latter, the hummous is a nice light color vs. a dirty mustard grey (Boiling tip: DON'T cover the pot! It will boil over and create a mess). Some favorite recipe variations: add fresh garlic, cumin, and/or fresh parsley to the blender. 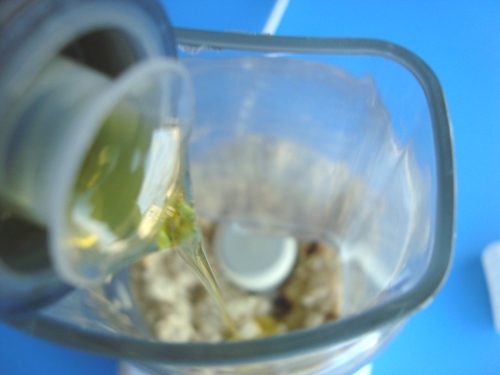 The tahini, garlic and lemon juice (or lime, or citric acid) should be added to taste. I like to use a lot of tahini because its healthy, and I also use the tahini made from whole sesame seeds - makes the hummous a bit darker. I also like to save a few whole beans(cooked) for garnish. Enjoy! Thank you for the great directions for making hummus. I made it and enjoyed it with a pita bread. It was the first time that I made hummus and you made it easy. I can't wait to see how my kids like it.